As PeopleSoft does not natively support Azure ADFS SSO Authentication, PeopleSoft and Azure ADFS SSO Integration is highly sought after. This integration is simplified with SSOgen SSO Gateway. PeopleSoft would be registered with SSOgen, as described in PeopleSoft SSO Configuration. When a user enters into PeopleSoft, user is redirected to SSOGen for authentication. 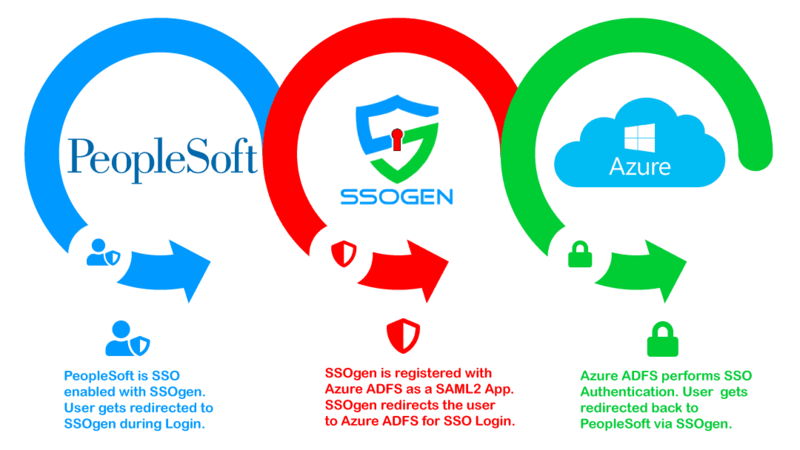 SSOgen in turn sends the user to Azure ADFS for SSO Login. Azure ADFS performs SSO Authentication using a login form, multi-factor authentication, or Desktop Authentication – Kerberos or Windows Native Authentication, WNA based on Azure ADFS SSO Configuration. Upon a successful authentication at Azure ADFS, the user is redirected back to PeopleSoft Home Page via SSOgen. The end user login experience would be pretty much similar to other Applications SSO enabled by Azure ADFS. PeopleSoft Application can be added to Azure AD Application Gallery by Azure Admin, and end users can launch PeopleSoft Applications like another Azure AD Application. User would access PeopleSoft Applications seamlessly from other Azure ADFS SSO enabled applications without having to re-login, and vice-versa. We are interested in a proof of concept, please send us the details. We have sent you the instructions for a PoC. Thanks for the interest. Sure, we have sent an email with the details. Thanks Angela!